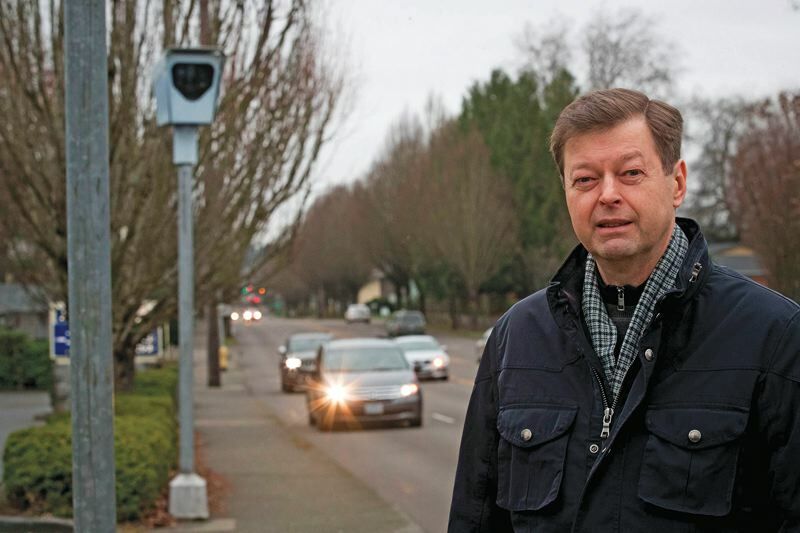 It all started when he looked into how red light cameras work after his wife got a ticket. Mats Jarlstrom never intended to be a crusader for constitutional principles, but the Beaverton resident has become the center of a controversy over who may advocate for change on technical issues in Oregon, and how the government may respond. The case began in 2013, when Jarlstrom's wife received a traffic citation from the city of Beaverton for a red light violation. The citation was based on video from a red light camera operated under contract by a company called Redflex. The couple does not dispute the facts of the case, but Jarlstrom became interested in how red light cameras work. Jarlstrom has a degree in electrical engineering, and he used his technical and scientific mind to understand the parameters of the camera system. The basics are simple. If a driver crosses the first line of the crosswalk entering an intersection after the light has turned red, he or she is subject to citation. The yellow light is intended as a warning that the red light is imminent. The Federal Highway Administration and ODOT specify the minimum duration of yellow lights based on the posted speed of the roadway, to provide adequate time to stop. "The city sampled approximately 90 traffic signal cycles taken over an hour's time at the intersection of Southwest Allen Boulevard and Lombard Avenue. The yellow change interval observed at that intersection ranged from 3.40 seconds to 3.56 seconds, with the average yellow change interval being 3.48 seconds." According to the memorandum, the variation in yellow light times is due to the technical capabilities of the controller unit and other equipment at the intersection. Beaverton has issued a statement saying, "The city's signals have always been within legally acceptable standards." A traffic court judge agreed with the city and upheld the Jarlstrom citation. "My wife paid the ticket," Jarlstrom said. But in his research, Jarlstrom also realized that while the yellow light timing formula works for drivers continuing straight through the intersection, it does not account for drivers who are already slowing in preparation to make a right-hand turn. Statistics bear this out, as most red light tickets are issued for failure to stop before turning right. "The four intersections that are here in Beaverton, you have more violations making right-hand turns despite the majority of traffic flow going straight," Jarlstrom said. "So the equation that they're using with the time of the yellow light is applicable to going straight, but when you're making a turn you need to slow down before you enter the intersection and that's not accounted for today." Jarlstrom worked out the math in support of his position and submitted his findings to the Oregon State Board of Examiners for Engineering and Land Surveying. He never expected what happened next. The board responded by investigating Jarlstrom for two years, finally issuing a $500 fine for unlicensed "practice of engineering." "They wanted to shut me up. That's the bottom line," Jarlstrom said. But Jarlstrom was not going to be quiet. He found support from The Institute for Justice, a nonprofit law firm based in Washington, D.C. With legal support, Jarlstrom sued the state of Oregon. The attorney general's office agreed with Jarlstrom, to a point. "We have admitted to violating Mr. Jarlstrom's rights," Senior Assistant Attorney General Christina L. Beatty-Walters stated in court. The government's proposed judgment would refund Jarlstrom's fine, but the case would apply to Jarlstrom only. That's important because the board has brought charges of unlicensed practice of engineering against others in the past. Previous cases include former Portland City Commissioner Dan Saltzman and former candidate for governor Allen Alley, for referring to themselves as engineers in campaign materials. Jarlstrom and his attorneys are not satisfied with a narrow judgment, and want to prevent the government from bringing similar charges generally. "We have a chance to change the law for all Oregonians," Jarlstrom said. "I feel this is the right thing to do because the board is censoring individuals' free speech." "You don't need a permission slip to criticize the government," said Institute for Justice Attorney Wesley Hottot, who represents Jarlstrom. "This board, and licensing boards across the country, think the First Amendment doesn't apply to them. They couldn't be more wrong." On Dec. 14, Magistrate Judge Stacie F. Beckerman, of the U.S. District Court for the District of Oregon, denied the state's request to close Jarlstrom's case. The lawsuit will proceed to trial.